The SILKOLA has been around for a long time. The effect is basic. A handkerchief vanishes, then reappears inside a sealed soda bottle hidden within a tube. 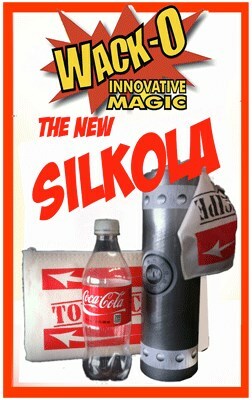 The Wack-O-Magic version has SEVERAL significant improvements over every other Silkola. It comes complete: An Ungimmicked Plastic 1/2 Liter Bottle, a Super-Smooth, Laser-Cut Bottle Cap, Special Tube with an all-new graphic on the outside that is OPEN on BOTH ENDS! , Two 12" x 18" Specially Printed Silks, and a Silk Vanishing Top Secret printed Bank Bag made JUST FOR THIS TRICK. The special gimmick has a beaded end, so you won't have to poke holes in your silks. Better yet, the gimmick allows you to use a MUCH larger silk. Magician/ Consultant Walt Anthony has written a PERFECT routine that follows a couple of thieves during their GREAT BIG COLA HEIST!! Watch as the secret recipe is stolen, vanishes, and reappears back in the Cola vault! When you get the WACK-O-MAGIC Silkola, you'll get the right props with the right gimmick to perform the right routine.